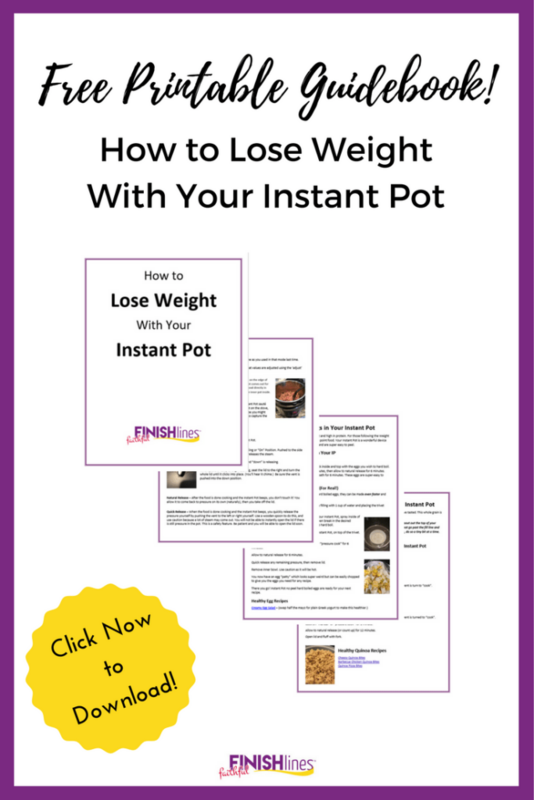 Did you know that you can utilize your Instant Pot to help with weight loss? Because the Instant Pot is such a wonderful and popular tool in the kitchen, I am excited to share some Meal Prep Ideas for Weight Loss using your Instant Pot. This is not a miracle tool but can be utilized to really help you stay on track. 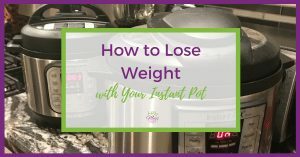 Below I will share tips, tricks, and my favorite tools to use the Instant Pot to help with weight loss. 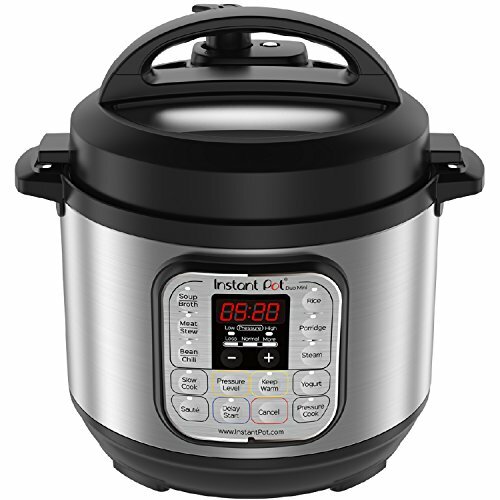 I absolutely love my Instant Pot pressure cooker! As someone who is maintaining a 100-pound weight loss, I understand the importance of using this time-saving cooking device for wholesome foods. This Today Show article shows how Brittany Williams lost over 100 pounds using her Instant Pot pressure cooker. 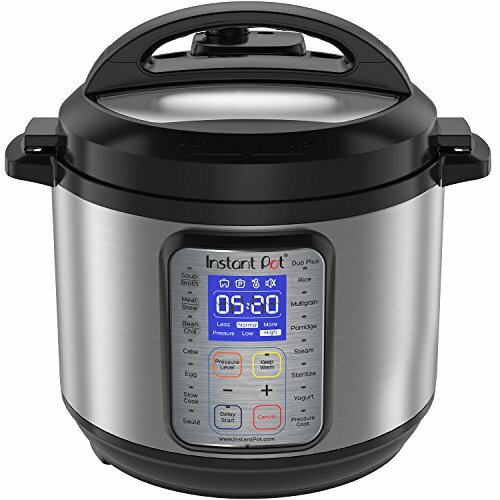 I don’t really understand how someone could lose weight using an Instant Pot. I need to lose over 50 pounds, so I’m certainly interested. But all I see is recipes for fatty beef roasts and cheesecakes. How is this device helpful for weight loss? It’s easy to understand her confusion over weight loss with an Instant Pot. Let’s dive deeper into what an Instant Pot can – and cannot – do for your weight loss efforts. Plus, discover the best Instant Pot weight loss tips and hacks! Ten years ago, I lost 100 lbs and have been maintaining that weight loss ever since. While I didn’t use my Instant Pot for this initially, I did utilize meal prep ideas for weight loss as part of my journey. I understand the importance of eating healthy foods and exercising in order to maintain weight. Since my weight loss occurred over 10 years ago, the Instant Pot wasn’t part of my arsenal during my weight loss process. But in the last year, I’ve found it a huge help for maintaining (which trust me, is just the same as the weight loss phase.) I use my Instant Pot several times per week to make all types of recipes, many of which are listed below. Your Instant Pot can absolutely be a huge part of your weight loss strategy. Instant Pot: What the Heck is It and Why Do You Need One? The Instant Pot currently comes in 3 different sizes and all three are great for weight loss recipes. It’s mostly a matter of your family size, desire for left-overs, and personal preference. Think of the Instant Pot like your blender. You can use your blender to make healthy smoothies or you can use it to make margaritas. (Don’t get me wrong – I love a good margarita, but obviously in moderation.) The Instant Pot is just like any other kitchen tool that can be used to make healthy, wholesome foods or it can be used to make high-calorie delicacies…so choose to use your Instant Pot to cook weight loss recipes! The Instant Pot stands above other kitchen tools, though, because pressure cooking imparts wonderful flavors and most of all save you time. Using an electric pressure cooker like an Instant Pot as part of your meal prep ideas for weight loss will result in success. Below are specific, helpful ways to use your Instant Pot for weight loss. Utilizing any appliance to help get healthy is not about the product as much as the mentality. The Instant Pot is ideal for use with meal prep ideas for weight loss since it provides so much convenience. Plan ahead for when life gets busy. Make core, healthy foods to eat daily. Use Instant Pot weight loss friendly recipes. 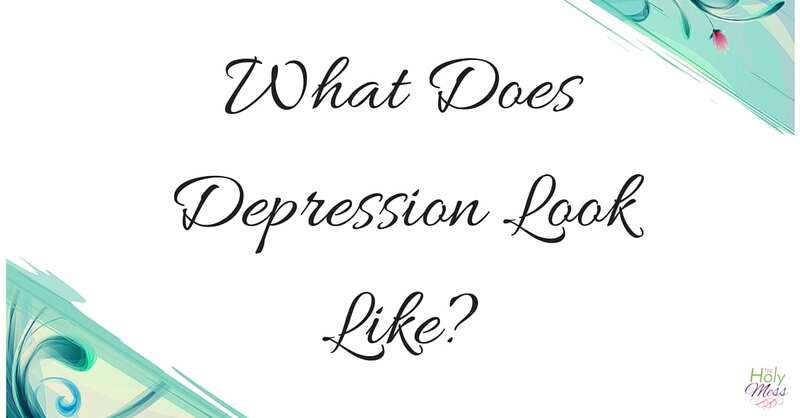 This tool will be a huge asset along with your journey to health! One of the top reasons people give for falling away from their healthy living and weight loss goals is that they are too busy. Believe me, friends, I get you! As a busy mom of 5 kids who works as a Family Advocate, is a pastor’s wife and runs my own business, I understand your struggle when it comes to juggling busy schedules. Yesterday I made a 14 bean soup with dry beans in one hour – no soaking the beans overnight, no pre-cooking. I have never been good at making dry beans, but these turned out perfect and taste amazing. When I don’t have healthy options available, I tend to grab chips, crackers, or whatever else we have in the pantry. Yet when the house is loaded with tons of fresh fruit and vegetables and I have healthy meals planned, I’m way more likely to stick to my eating plan. Click here for The Holy Mess Grocery List and Meal Planner Printable to plan a week’s worth of healthy meals and snacks. Most of us know that we will save money and eat WAY healthier when we avoid the drive-through, take out, and restaurant foods. These are okay as a once in a while treat, but it’s important to not rely on these high-fat, high-calorie foods on a regular basis. With the Instant Pot, you can cook from frozen or make things like dried beans or rice and still have most meals ready in an hour or less. What sold me on using the Instant Pot? The fact that you can cook foods right from frozen. This is hugely different from the oven or a slow cooker. The first time I cooked a huge whole chicken from rock-solid-deep-freeze-frozen and had dinner on the table in a little over an hour, I was completely sold on the value of pressure cooking. For many years I’ve been freezer cooking family meals. Once a month I cook enough dinners for the upcoming month and freeze them. The Instant Pot made that whole process even easier because the meals can be cooked from frozen. 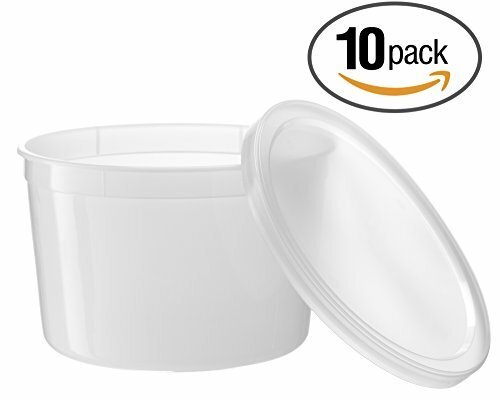 The key is to use round containers like these because you can pop the food right out and stick it directly into the Instant Pot – no thawing required. When it comes to freezer menus, I’m a big fan of Once a Month Meals. They do all the planning, grocery lists, and prep instructions for you. I love it! Scroll down to the bottom of their website and sign up for the Once a Month Meals free Instant Pot or Diet mini-menu and give it a try. You won’t believe how easy Instant Pot freezer cooking will make your life! The Instant Pot will be a huge help for you when it comes to making healthy foods as your go-to staples. Instant Pot Greek Yogurt – Recipes abound but here is a good Instant Pot Greek Yogurt one to get started. Beans – Beans can be cooked from dry in less than an hour in the Instant Pot. Here is a basic Instant Pot black bean recipe. Hard-boiled eggs – Many people use the 6-6-6 method for hard-boiled eggs. Cook eggs (and 1 cup of water) for 6 minutes and allow to natural release for 6 minutes. Cool in an ice water bath for 6 minutes and you are ready to go. If you are going to chopping the eggs for a recipe like low-fat chicken or egg salad, check out this awesome Instant Pot No Peel Hard Boiled Eggs hack. Whole grains – Quinoa, brown rice, wheat berries, and more. Here is a one-minute quinoa recipe. Lean meats – Add pre-cooked chicken breast, pork tenderloin, or lean beef to salads, taco bowls, and more. Here is an easy shredded chicken recipe. While there are certainly decadent Instant Pot recipes, did you know there are healthy alternatives you can use for Instant Pot weight loss recipes? That’s the awesome part of the Instant Pot is so popular – you can find recipes for so many wonderful foods that are also good for you. Here is just a sampling of some healthier Instant Pot recipes that have been made successfully by people time and again. I love my Instant Pot weight watcher recipes! If you are following the Weight Watchers program (like me), there are some great Freestyle pressure cooker recipes and cookbooks. Here are a few of my favorites. Check out thisInstant Pot for Weight Loss online course for a full pressure cooker diet plan with recipes, meal plans, grocery shopping lists and more. As you can see, using the Instant Pot as a weight loss tool will make your life easier. Using these meal prep ideas for weight loss including your Instant Pot or another electric pressure cooker will be life-changing. A delicious meal doesn’t have to be loaded with calories or take hours of your time to prepare. A few simple tricks mentioned above can make meals easy and healthy to help you lose weight faster than ever before. When making the roast frozen does it change how long you should keep it in the IP? Roasts usually take 60-90 minutes. If it’s frozen solid I would add 10 minutes. If you open it and it’s still not done in the center or not as tender as you would like, add 10 minutes more. Loved reading this post. It is inspiring me to get back to meal planning and batch cooking. I am currently following weight watchers and have lost 25 lbs. I “fell off the healthy eating wagon” a few months ago and gained 10 back. I am back at it and would like to lose those 10-15. I also starting running a few years ago but when the weather in my area gets cold, I don’t run or exercise as much. I just can’t find something that will keep me going all year round. I’ve gone to boot camp classes and really enjoyed them but they get costly. So anyway, I just wanted you to know this was a great post and I’m excited to try some of these recipes. 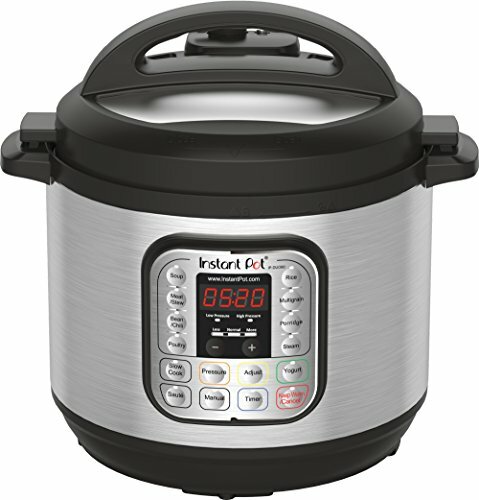 I’ve had my instant pot (8 qt.) for a while and use it quite often. I have not tried cooking a freezer meal from frozen but have done a beef roast and it is AMAZING! I’m looking forward to strolling through your blog! Hi Carol, there are many free exercise videos on line, youtube. I am a fan of Beachbody.com – they have a OnDemand program about $35 a quarter. At some point you can get it for $99 a year – it is awesome, in your home, on your schedule and any level and don’t need equipment if you don’t want, look up ShawnT. I’ll do that! Thanks for the tip Sylvia! Sarah, I want to make the cheesecake, but I couldn’t find rice flour. Can I substitute with tapioca starch? Hi Judi, Good question. I didn’t create that recipe so I am not totally sure. You might try posting this question on the same blog that hosts the recipe. Hope this helps. I already bought the tapioca flour, so I am going to go with it. Internet searches do say one can be used to substitute the other. Thank you! Just got an Instant Pot will be setting it up over the week end! 3. If you cook beans how long will they keep for (to use in various recipes) and what’s the best way to store them? I’ve always used canned and making from scratch sounds amazing. I’m sure you can get smaller round containers if you have a 3 quart IP, or even a 6 quart. Those are 64 oz so look for a size smaller than that. Beans – I would keep them cooked in the fridge for 3-4 days, and they can also be frozen. We bought the pressure Cooker xl a couple years ago. I have just started using it with some of the recipes I find on line. I’m debating on whether it would be worth it to buy an IP now. Your thoughts? I feel like they do much of the same things.